Throughout America a chorus of students of the Honorable Minister Louis Farrakhan are responding to what has become a renewed effort over the past few months to assassinate the character of the Minister. In an extensive analysis, rooted within a scriptural context Bro. 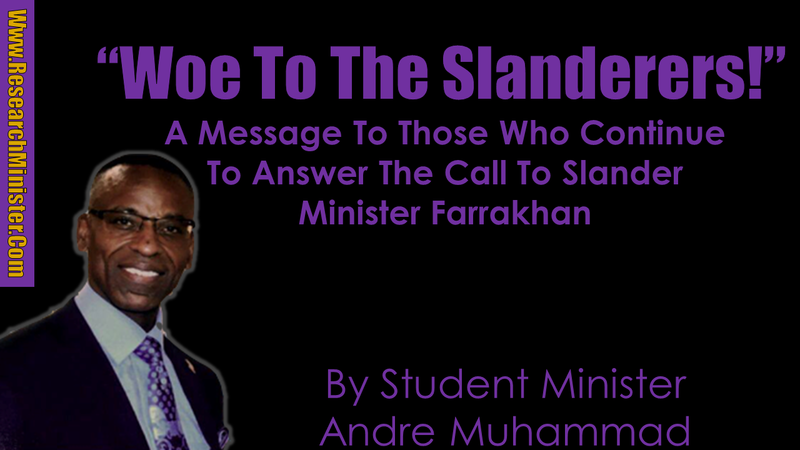 Andre Muhammad rebuts the pundits, critics, weak politicians, provocateurs and who have made a cottage industry out of slandering Minister Farrakhan. ResearchMinister.Com is happy to share Student Minister Andre’s bold essay with our readers. Read, Reflect, Act & Share. 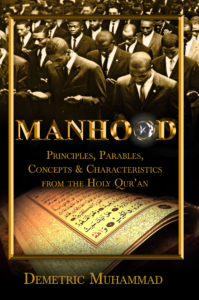 In 1964 the Most Honorable Elijah Muhammad wrote the following: “As you know, we have been all but universally attacked. Here for the last four or five months, especially. Universally attacked. And this attack was for the purpose of getting rid of me . . . So I wish that you remember this: That this kind of attack that has been made on me, personally, and indirectly on you . . . This I like that you would get this in mind, ministers, as you are my helpers, that these kind of attacks, as you are not through with them, we have something else to face yet. It may not be the same nature, but we have attacks, yet, to come on us. I don’t want to excite you, now, in the very least. Don’t get excited in the very least, because if I’m not excited, and I’m the hare in front of the hound, I don’t think you should get excited. First: It is out of love for the Honorable Minister Louis Farrakhan, and the love that he has put in my heart for the Most Honorable Elijah Muhammad that I write this brief note. It is a love born of the nature of God in me that Minister Farrakhan’s preaching has touched and awakened. Second: The love of which I speak engenders in me a strong sense of duty that I, along with my colleagues, lift my pen and voice to defend our beloved Minister Farrakhan, and in so doing, we defend ourselves. Third: The above words from the Most Honorable Elijah Muhammad are, to me, divine orders for those of us whose lives have literally been saved as a result of the transformative effect that his teachings, through Minister Farrakhan, has had on us. Love compels me to follow those orders. The Holy Quran says in Chapter 104 entitled “The Slanderer”: 1. Woe to every slanderer, defamer! 2. Who amasses wealth and counts it — 3. He thinks that his wealth will make him abide. 4. Nay, he will certainly be hurled into the crushing disaster; 5. And what will make thee realize what the crushing disaster is? 6. It is the Fire kindled by Allah, 7. Which rises over the hearts. 8. Surely it is closed in on them, 9. In extended columns. Slander is the action or crime of making a false spoken statement with the intent of damaging to a person’s reputation. Slander is an untrue defamatory statement that is spoken orally. When that false spoken statement is put in writing, it is called Libel. Slander and libel are both types of defamation. Defamation is a false statement presented as a fact that causes injury or damage to the character of the person it is about. In defamation law there is an important difference between stating an opinion and defaming someone. Yes, the Honorable Minister Louis Farrakhan is a “public figure”, but when a person makes a statement with knowledge and facts that the statement is untrue or with reckless disregard for facts and truth it becomes a criminal act. The intent of the statement determines if it’s criminal. The intent of the ADL, SPLC, the U.S. Government has been clear according to their own documents, and when you repeat from them what has been proven to be false, then you become a part of their lie and their crime! No. This is not a veiled threat. The threat is in the aforementioned verse of the Holy Quran. The question is who’s threat will you fear, God’s or the ADL, SPLC, and the U.S. Government? It’s clear that you fear the latter. The Hon. Min. Louis Farrakhan has so carefully taught us that God raises up a messenger or a warner with a message that is designed to guide people and nations onto a right course that they may avert God’s punishment. We live in a world built upon and ruled by lies, deceit, murder and plunder. Anyone who would expose the architects who built and maintains the construct is targeted for destruction. The people at the base of such a world are always the poor, ignorant masses of the society. When the servant of God is present in such a world the ultimate aim of that world is to kill the messenger of God. The one that God raises must have this very essential attribute in his character . . . COURAGE. That courage evolves into FEARLESSNESS as God’s servant embraces the message and engages in the mission that God gave to him. The onlookers from among the poor are especially drawn to the spiritual magnetism of God in His servant as he works on his mission. So, the wicked rulers move on God’s servant, because those who’s backs upon which their wicked rule stands are being drawn out from underneath them. The world and rule of the wicked is threatened, so they seek to frighten those who are drawn to God’s servant. They know that ultimately those who are drawn to God’s servant will lose their fear of them. It seems that most of our brothers and sisters in American politics, academia, media and entertainment are in a state of perpetual fear of members of the Jewish community, the Anti-Defamation League, and the Southern Poverty Law Center. They have them terrified to publicly speak well of, be seen in the company of, or show any sign of support of Minister Farrakhan and the Nation of Islam. They have been able to, upon demand, cower some of them into slandering Minister Farrakhan or at least put distance between him/us and themselves. We who love and help the Honorable Minister Farrakhan have grown weary of your evil treatment and talk of him. It’s gotten very difficult to offer you a smile and extend our hand to shake yours in brotherhood when we see you. Yet we, like the Minister, turn the other cheek. But, it’s time to challenge you and your enemy to prove what you say about the Minister! I was happy and proud to see our sister, Tamika Mallory, stand strong and dismiss Meghan McCain’s attempt to force her to denounce the Minister. You should take notice of her as she takes courage on her mission and become more and more fearless in the face of the enemies of truth. Minister Farrakhan is a man who has been absolutely stalwart in his service to our people and black leaders. Those of you who have repudiated and denounced him at the beckoning of your open enemies, or to gain some personal advantage, did not receive a response in kind from the Minister. He responded like a true Christian would by “turning the other cheek” again and again. Some of you repudiated and denounced the Minister after he embraced and defended you! He continually humbles himself and suffers abuse and disrespect from you. You do this in a futile effort to appease your enemies, or gain personal advantage, or maintain your sick, pitiful, political relationships with our 460-year-old open enemies. In private you present yourself as a friend, but at the prompting of the ADL, SPLC, or prominent members of the Jewish community you become an enemy. You KNOW the Minister is not what they say of him, but you repeat the lies of your enemy out of fear, or because your enemy has something you want that is more important to you than principle and character. So, you’re not a friend. You’re a “frenemy.” You exhibit both the characteristics of a friend and an enemy to the Minister and the Nation of Islam. How long will you continue to engage in this traitorous behavior? In recent days Texas Rep. Al Green issued a statement calling Minister Farrakhan a “bigot”, and likened our beloved Minister Farrakhan to Donald Trump. I was personally outraged and repulsed! My mind could not meld together Rep. Green’s words and my memory of the image of Rep. Green embracing the Minister in a Texas Church. This was a grave offense to me, because I see an attack on the Minister as an attack on my “spiritual father.” He is an extension of the “spiritual fountainhead” from which I, and millions more have been blessed to drink in the wisdom and guidance of God for our lives. I’m just one of millions who see the Minister in the same or a similar light. The sad part is Rep. Green knows that he spoke a lie. The wickedness of it is the satanic puppet masters, with their hand up Rep. Green’s back, have put fear in him in a futile attempt to demagnetize Minister Farrakhan and de-rail the Women’s March. Even worse Rep. Green and his handlers offer NO PROOF, because they know there is NONE. Minister Farrakhan and the Nation of Islam’s Historical Research Department has offered and made available three tomes of the Secret Relationship Between Blacks and Jews documented proof of the pure evil perpetrated against black people by Jewish Americans. The first book deals with ‘Jewish involvement in the Trans-Atlantic Slave Trade’. The second book deals with ‘How Jews Gained Control of The Black American Economy’. The third book exposes the false basis upon which the Black – Jewish “friendship” was established in it’s examination of ‘The Leo Frank Case’. In fact, the Minister sent Books One and Two of the research to some of our leaders. The Minister made it clear that the books contained research from Jewish libraries of what Jewish Rabbis, Scholars and Historians have said about “their involvement” in the Trans-Atlantic Slave Trade and “their control and exploitation” of the Black Economy. How could you continue to obey them when the San Francisco Police Department found that the ADL illegally spied on over 950 political organizations including the NAACP, Rainbow Push, American Civil Liberties Union and others? How could you continue to do their bidding when they infiltrated countless police and sheriff departments across the country, bribing police officials and illegally obtaining classified government data on at least 20,000 American citizens? How could you continue to do their bidding when they were caught selling information on Anti-Apartheid groups to the South African Government? How could you continue to do their bidding when they were caught passing surveillance and classified police data on Arab-Americans to Israeli authorities who then used the ADL data to illegally detain American citizens visiting Israel? Right now they are working to get federal legislation passed to make “fact based criticism” of Jews and boycotting Israel a CRIME! According to “Newsweek”, In May 2017, Texas became the 17th state to prohibit contractors from supporting a boycott of Israel. “Texas state law (Chapter 2270 of the Texas Government Code), currently does not allow school districts to hire a contractor unless the contract contains a written verification that the contractor does not boycott Israel and will not boycott Israel during the term of the contract. Twenty-six states now have such legislation. The Honorable Minister Louis Farrakhan is not who most of us think he is. Wise members of the Jewish Community know who he is and whom he represents. In the Bible, Nicodemus, a ruler of the Jews, admitted that he and those he ruled knew who Jesus was and whom he represents. Even so, they opposed and sought to kill Jesus! Their knowledge of who Jesus is, and who Jesus represents is also found in the Holy Quran. It says in the Holy Quran Chapter 2:146. Those whom We have given the Book recognize him as they recognize their sons, but some of them surely conceal the truth while they know. What kind of people would knowingly oppose a servant of God? What kind of people would knowingly and openly oppose Jesus? Jesus already answered that question in John Chapter 9 verse 44. You all should go and read it, and when you finish, ask yourself what kind of person would help them oppose Jesus by slandering an man walking in the footsteps of Jesus The Christ.